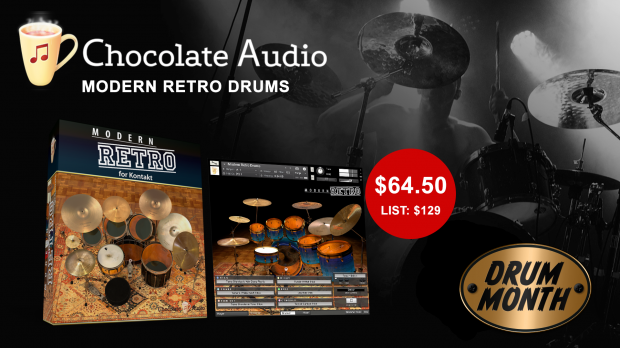 Modern Retro Drums features kits have been used since the ’90s on some of the best selling music ever recorded. During Drum Month these fantastic sounding kits are on sale at 50% off. With 19 Styles and 1119 patterns, the focus for Modern Retro drums was to deliver a collection of bread & butter grooves and fills that set these the drum sounds apart. The Styles are freely inspired by some of the most successful singles from the 90s. There is a lot of creativity and variety used to capture the feel of those hit songs. The IR Reverb module features 36 unique proprietary impulse responses. These are derived from vintage plates, hardware and typical rooms, which, when used with drums, push the limits of what can be done with a single drum kit. This entry was posted in DontCrack, Promotions, Virtual Instruments and tagged 90's drums, Chocolate Audio, Modern Retro Drums, sampled drums, virtual drums. Bookmark the permalink.